David Antonio P. Baga, Grade 6 pupil of La Carlota South Elem. 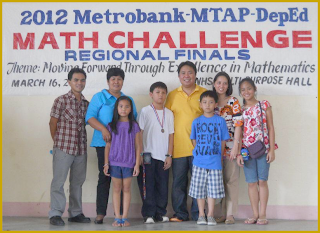 School 1, Division of La Carlota, was the 3rd place in the individual category of the 2012 Metrobank-MTAP-DepEd, Math Challenge, Regional Finals. "Davan, nickname of David Antonio, has made it. At least in the long run, there's an impact on the math review of the pupils every Saturday. Davan has made it and has given a name and honor to our Division," relayed Ruth P. Convite, EPS Math of the Division of La Carlota City who accompanied the four contestants. 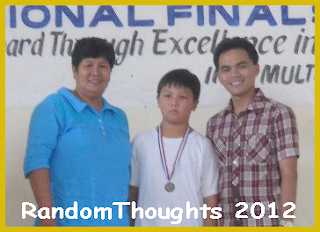 Convite added Davan was also the math contestant in the 32nd Regional Super Quiz Bee at Region VI - Western Visayas, DepEd office on February 28, 2012. He was also accompanied by his coach, Mr. Kudemos. "Davan is a humble kid, somewhat reserved, and is skillful in math. He is the son of La Carlota vice mayor, David Baga, Jr.," told his coach, Mr. Kudemos. David Antonio received a medal and cash award of Two Thousand Pesos (Php2,000.00) from Metrobank with a certificate of recognition. And his coach, Mr. Marben Kudemos also received a certificate of recognition. In the elementary team category, Djiselle Mae Agbuya was the companion of David Antonio Baga. While in the team category, secondary level, the team of Dion Paul Caspe and Janrey Artus of DHSBNHS got the 4th place. This year's MTAP-Math challenge was held at Iloilo National High School multi-purpose hall, March 16, 2012 with a theme: "Moving Forward Through Excellence in Mathematics"
In cooperation with the Math Teachers Association of the Philippines (MTAP) and the Department of Education (DepEd), Metrobank Foundation holds the Math Challenge to develop interest in Mathematics among elementary and high school students, to inculcate important mathematical concepts and proficiencies, and to further improve the mathematical skills of Filipinos. The contest is in two categories: individual (written exam) and team (orals). Before the contestant be qualified to the regional level, they must first be the winner in the Division level, after hurdling the elimination round. Davan was morally supported by the presence of his family during the contest, his father, David Baga, Jr., his mother, Dorle P. Baga and the two grandmothers. Thank you Sir Camporazo for your generosity in featuring this event.Congratulations to the coach,Mr.Marben Kudemus in giving his best during the review from the elimination round until the regional competition.Congratulations to the mestizo and humble David Antonio P. Baga.For us, Davan you're the best! You're welcome. We're very proud with the excellent performance of Davan who the mathematics skill. This math wizard is something to watch in the future! Congratulations! I remember myself 5 years ago (4th yr high school) taking this journey. :) Kudos to all the people behind this success. This makes me a proud La Carloteno.